Biden: "Surely the framers of our Constitution did not envision a presidential candidate of one of the major political parties personally attacking a sitting federal judge." Vice President Biden apparently forgets that, in 2010, President Obama took the unprecedented step of denouncing not one but five sitting federal judges—the five-Justice majority in Citizens United—during his State of the Union address. Warren: "Now the Supreme Court of the United States sits paralyzed [without a ninth Justice], unable to deal with its most challenging cases." Perhaps Sen. Warren does not remember that of the four Supreme Court Justices who have addressed this concern, all four—including two Democrat appointees—have said the Court is doing fine with eight Justices. When Justice Breyer addressed the issue, he noted that a ninth vote only makes a difference in a few cases each year, reminded us that 4-4 splits are a problem only "if you believe that the Supreme Court should decide all the major issues for the country," and added that "I happen not to believe that." Biden: "[Trump] would defy the courts if they ruled against him as President, not just in a business case, but a case challenging government abuse of power." What Trump might do as President is speculation but Biden seems unaware that the current President, Barack Obama, defied U.S. District Court Judge Andrew Hanen after he ruled in favor of the 26 states challenging Obama's executive action on immigration as an abuse of executive power. Obama Administration attorneys swore to Judge Hanen that Obama's amnesty plan was on hold, when in fact the Administration was implemented it for 100,000 illegal immigrants. Hanen ultimately concluded that Obama's Justice Department lawyers had intentionally lied to him. Warren: "We are not a nation that disqualifies lawyers and judges from public service because of race or religion or gender." Apparently Sen. Warren has no memory of the 2003 Senate Judiciary Committee hearing for Eleventh Circuit nominee Bill Pryor, where Democrats implied that Pryor's "deeply held" Catholic beliefs put into doubt his ability to be an impartial judge. As former Boston mayor and U.S. Ambassador to the Vatican Ray Flynn noted at the time, his fellow Democrats were basically saying "If you are a faithful Catholic … and you're willing to acknowledge that openly … that basically disqualifies you … to be a member of the judiciary." 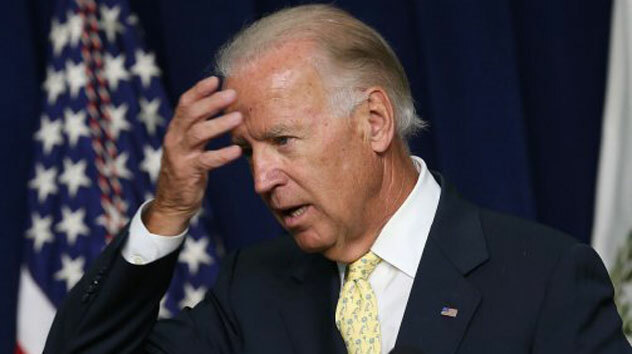 Biden: "I don't think the framers envisioned a presidential candidate accusing a judge of being incapable of reaching a fair decision because of his ethnic descent." When President Obama nominated Supreme Court Justice Sonia Sotomayor, he endorsed her statement that “a wise Latina woman with the richness of her experiences would more often than not reach a better conclusion [as a judge] than a white male.” Biden neglected to mention that, by his logic, the framers would not approve of his boss's belief that white male judges will reach fair decisions less often. Warren: "After capturing the Senate in 2015, [Senate Republicans] just slowed judicial confirmations down to a trickle. Judicial emergencies multiply, cases pile up, courts are starved for help." Warren seems unaware that the 87 current vacancies in the federal courts represent a ten percent vacancy rate, which falls within the normal range. President Obama has only named nominees for 56 of those vacancies, indicating that he does not share Warren's concern. Biden: "It would border on an impeachable offense for a President actually to use the great powers of the office to attempt to undermine a federal judge by placing pressure on that judge in any case." Perhaps Biden is confusing Donald Trump with President Obama, who tried—apparently successfully—to pressure Chief Justice Roberts into switching his vote and upholding the Affordable Care Act in NFIB v. Sebelius (2012). As U.S. Senator and former Supreme Court clerk Mike Lee has noted, "There was a real campaign of intimidation by a lot of Democrats in the Senate and also by the White House, publicly making statements to the effect that this is going to diminish John Roberts legacy as Chief Justice if he invalidates [ObamaCare]." Warren: "Where's Paul Ryan's condemnation of the … smears and slime of [Obama's] qualified judicial nominees?" Besides forgetting that Paul Ryan and the rest of the House have no role in confirming judicial nominees, Warren overlooked the smears and slime directed at President George W. Bush's judicial nominees. Each of the eleven times Bush nominated a southern white male to the federal appeals courts—with the exception of the two instances in which a Democratic senator picked the nominee—Democrats tried to obstruct the nomination using a campaign of personal destruction that focused on the worst stereotypes about southerners, specifically accusing the nominees of being insensitive to the rights of minorities, women, gays, and/or the disabled. Warren: "Sen. Jeff Sessions of Alabama has attacked the integrity of several of President Obama's nominees. For what? For having some association with the American Civil Liberties Union." Rather than concluding that Sen. Warren has a double standard, let's assume she forgot that Senate Democrats are guilty of doing exactly what she accuses Sen. Sessions of. During the previous Administration, Democrats assume the worst about the association of John Roberts and several other Bush nominees with the Federalist Society, a center-right lawyers group. In one memorable instance, Senate Judiciary Chairman Patrick Leahy asked Fifth Circuit nominee Edith Brown Clement ten different questions about her involvement with the group.